Happy Memorial Day from all of us at CINEMA INSOMNIA! Cinema Insomnia – S1E12 – Bucket of Blood, 2016 Version from OSI 74 on Vimeo. Per request of Sleepless Knight Rev Steve Galindo, enjoy this “hip” classic Cinema Insomnia episode featuring the Roger Corman’s A BUCKET OF BLOOD. Want to catch more CINEMA INSOMNIA fun? Check out our the ROKU channel OSI 74! MR. LOBO Takes Us On a Wild Ride In BIZARRE DIMENSIONS! Imagine your old comics and shows like TALES FROM THE CRYPT and THE TWILIGHT ZONE. What if there were a comic book that combines the two to bring out those not only memories but awaken a new set of stories. Get ready, THEY ARE FINALLY HERE! Originally published in the UK from WRENCH PRODUCTIONS, the BIZARRE DIMENSIONS comic book is now available in the US! Get your signed Comic Book starring MR. LOBO as your Twilight Zone type anthology host, guiding you into the world of BIZARRE DIMENSIONS. Not to be confused with the BIZARRE TRANSMISSIONS FROM THE BERMUDA TRIANGLE show on OSI 74-BIZARRE TRANSMISSIONS is a horror anthology magazine. How would we describe this series? Well…BIZARRE is the only way to describe the stories you will find within written by CLIFF JONES with way-out art by GRAYHAM PUTTOCK and ANDREW RICHMOND! Fans of the classic 1970’s comics like CREEPY and EERIE will love this. Issue 2 of BIZARRE DIMENSIONS is currently in the works now and we will keep you updated on it’s release. If you’d like to support this indie project and would like your own personal copy, you can get it ONLY through US Direct from MR. LOBO in the OSI 74 shop for $10 an issue! With this Limited Edition copy, it is also personally autographed by MISTER LOBO of CINEMA INSOMNIA, PLAN 9 and more. Order today and journey into weird worlds with this rare collectible signed, bagged, boarded and shipped straight to you while supplies last! Don’t forget to grab your copy today, Sleepless Knights! Sleepless Knights! CInsomniacs! Banned Cinema Insomnia Episode Mysteriously Appears on OSI 74 Lineup! A strange movement has taken place in the OSI 74 lineup. 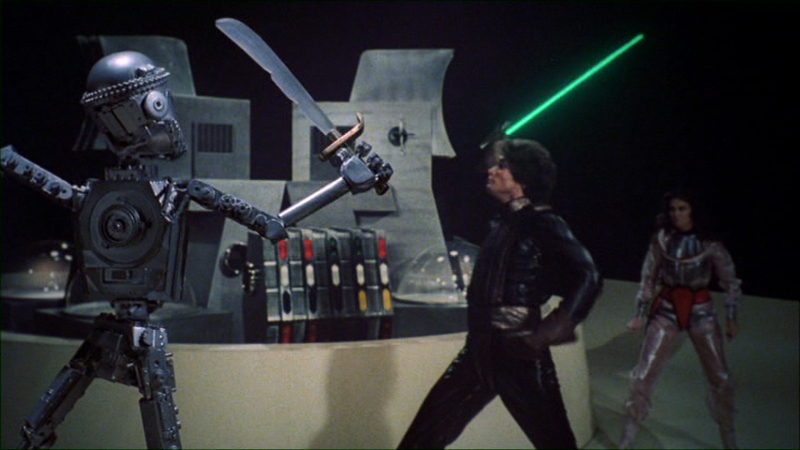 Sources tell us that the classic banned CINEMA INSOMNIA presentation of STARCRASH (1972) has suspiciously appeared out of the darkness and onto OSI 74. This low budget knock-off was essentially shamed into obscurity but always held a warm place in Mr. Lobo’s tiny cult movie fan heart. Of course, he had a HUGE star crush on CAROLINE MUNRO who played the hero of that film, STELLA STAR. In 2004, Mr. Lobo discovered that the last copy of “STELLA CRUSH” existed on board Deep Space Super Station One. According to sources at OSI 74, “before the last copies of the film were destroyed by the combined efforts of the Caroline Munro Fan Club, Christopher Plummer’s estate, and George Lucas’s lawyers, the deep space station recorded the film on magnetic tape. By using one of two Dynabeam receivers (Lobo had one and Europe’s number one film hostess Astra Naughty had the other) Lobo was able to re-broadcast it for his Sleepless Knights to enjoy. Lobo’s Dynabeam feed is interrupted when a group of Louisiana Klingons attack the station. The stations curator jettisons the tapes before the station is destroyed, but they are now scattered across the galaxy. As to why it has appeared on our ROKU channel, Ladiea and Gentlemen, rumors have circulated that the same Russian Cyber-Terrorists from the Red Planet that have been tampering with the numbers of various OSI 74 shows might be trying to get OSI 74 President and our beloved host, MR. LOBO, in trouble again. To make this more strange, the episode appears to be a half hour-longer and contains material that even Mr. Lobo doesn’t remember. So sit back, relax, gather the family around and indulge in the “most ambitious Cinema Insomnia Episode to date”…..